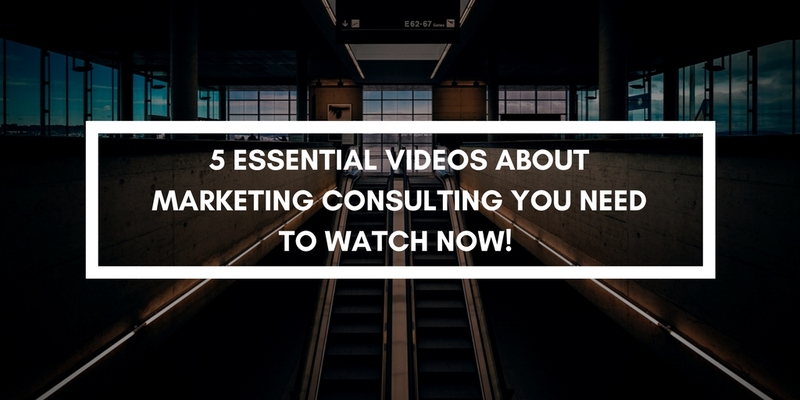 5 Essential Videos About Marketing Consulting You Need To Watch Now! Anyone in the marketing consulting industry knows that today’s businesses face a lot of challenges, some considered part of the business nature and some brand new. With so many competition and pressure to come up with new ideas to sell yourself to big and small businesses, marketing consultants have to always figure out a new way to stand out and appeal to different kinds of businesses. If you are an industry professional or looking to take a step into the fast-paced world of marketing consulting, we have gathered 5 videos you have to watch to help you with your daily endeavours. Why you should watch it: this video is basically a free business plan for those who are looking to start-up their own marketing consulting businesses. The video touches on trend awareness, and a few other things you need to know when it comes to marketing and the business that revolves around it. Host: Tai Lopez, a successful author and owner of a social media marketing academy. Length: The video lasts about an hour, so maybe watch it over your lunch break? Why you should watch it: This particular video is a cheat sheet on how to ensure you sell your digital marketing services well. This video is just an introduction to what CovetedConsultant has to offer. They cover videos on everything you need to know as a marketing consultant from starting your business to how to sell different types of marketing services on different social media platforms. We may have just given you a video to one link, but we suggest you subscribe to his channel here. Length: This video lasts 6:51 minutes but his videos ranges from 2 minutes to 15 minutes roughly. Why you should watch it: What better way to gain inspiration on marketing consulting than from a veteran of the marketing consulting industry himself. Jonathan Henley a Freelance Marketing Consultant and writer with years’ worth of experience, The interview done at On The Edge Digital event in London in 2014 talks about why you should tailor your content and how, understanding your audience and how to make your content work even harder for you. Why you should watch it: Even though the year 2017 is almost over, it is still not too late for you to pick up on this year’s biggest marketing strategies to implement it to your business or your client’s business. This video discusses what’s big and what’s not, what’s new and what’s out. Just like CovetedConsultant, this video is also just an introduction to what else its site has to offer and we suggest you subscribe to it too here. Noah Kagan has a more chill out, laid-back approach to marketing yet still covering in depth discussion about the various marketing tools from email marketing to a more traditional approach on how to market your book. Don’t have much time and just want to skip to the important part? Kagan makes it easy for people who are on the go by providing a quick link on his video description section where listeners can just choose which strategy they want to listen about. Fun Fact: Kagan used to work for Zuckerberg (Facebook). He was employer number 30 before he got fired but made his way back by getting Gambit, another one of his previous company to get over $30 million in revenue. Length: this particular video lasts less than 7 minutes although his videos lasts anywhere between 2 to 15 minutes. Why you should watch it: Only because Apple is probably one of the most successful companies on Mother Earth and we all know Apple’s marketing is one of the best out there, hands down. Who else is able convince you that you need the $999 smartphone even though it would probably mean you will have to walk to work right? In this video Dan Lok dissects the marketing strategy used by Apple in order to achieve success. If you need ideas on how to implement a successful marketing strategy for your client, than this is it. Host: Dan Lok, a multi-millionaire serial entrepreneur and an international best-selling author. Length: this video lasts a little bit under 50 minutes, it’s almost like you’re sitting in a conference but it is worth it. We hope that these videos will get your creative juices flowing. Remember, if you need any help, feel free to visit ThunderQuote for all your sourcing needs!